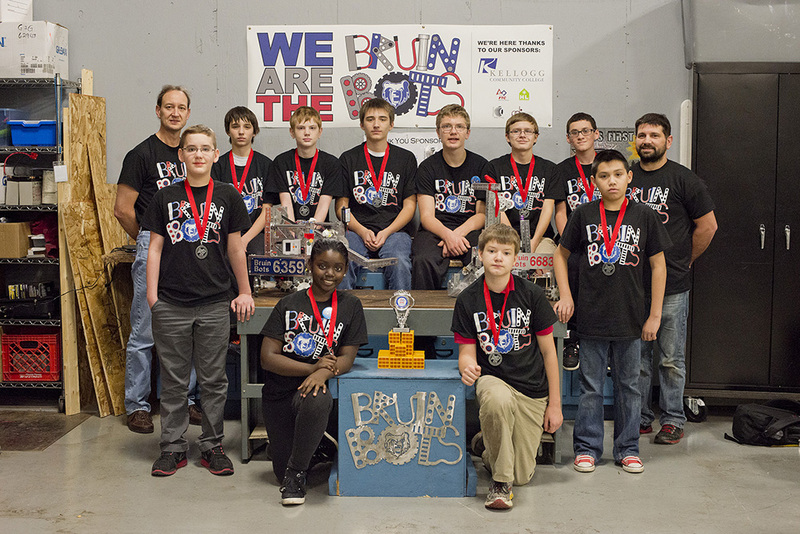 Kellogg Community College invites all area sixth- through eighth-graders to join the Bruin Bots, a youth robotics team that builds and programs robots for competitions with other teams around the state. Team practices will be held from 4:30 to 7 p.m. Wednesdays and Thursdays Sept. 20 through Dec. 14 at KCC’s Regional Manufacturing Technology Center campus, located at 405 Hill Brady Road in Battle Creek. Participation is free and requires no special skills or knowledge, and participants may start at any time as space allows. In addition to practices, participants will compete as a team at multiple regional robotics competitions including the FIRST Tech Challenge, which may qualify them to apply for special college scholarships through the FIRST Scholarship Program. Space on the Bruin Bots team is limited, and spots will be filled on a first come, first served basis. Individuals interested in signing up for Bruin Bots can do so online at https://goo.gl/forms/O7VZUYerqCFMAMCt1. For more information, call KCC’s Lifelong Learning Department at 269-965-4134 or email ll-info@kellogg.edu.